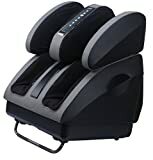 🥇Top Foot Massagers - Don't Buy Until You Read this! Amazon Price: $49.17 (as of April 4, 2019 6:55 am - Details) Product prices and availability are accurate as of the date/time indicated and are subject to change. Any price and availability information displayed on the Amazon site at the time of purchase will apply to the purchase of this product. This is the #1 best-selling foot massager on Amazon and for good reason. 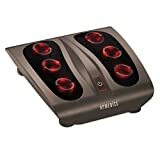 The HoMedics FMS-270H Deep Kneading Shiatsu Foot Massager gives a deep kneading shiatsu massage with rotating rollers that really get into your feet. Just press won harder to increase the strength. If you have very high arches, this massager might not work well for you. It has simple one-button operation. Push it once to start the massage action, a second time to add heat. Most massagers of this type only have 4 heads, this has 6. With 3 nodes per head, that's like having 18 fingers rubbing your feet! Great Price at Amazon with FREE SHIPPING. 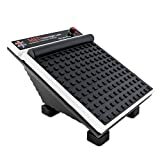 Amazon Price: $249.99 $129.99 You save: $120.00 (48%) (as of April 4, 2019 6:55 am - Details) Product prices and availability are accurate as of the date/time indicated and are subject to change. Any price and availability information displayed on the Amazon site at the time of purchase will apply to the purchase of this product. This awesome little foot massager delivers 3 kinds of massage action to your feet - shiatsu, air pressure and vibration. Add in a touch of heat (which isn't a lot admittedly) and you're going to love it. 5 different intensity levels. You should probably start slow with this one on the lightest setting until you get used to it. The cloth is washable and feels nice. There is a big discount going on right now at Amazon. Amazon Price: $239.00 (as of April 4, 2019 6:55 am - Details) Product prices and availability are accurate as of the date/time indicated and are subject to change. Any price and availability information displayed on the Amazon site at the time of purchase will apply to the purchase of this product. Ok, so you really want to go for the best and you like the idea of leg, calf and foot massage and you want heat too? This is the top of the line foot massager that can give you that POWERFUL foot and leg massage. But a word of warning, this foot massager is strong and can take a few times to get used to. Don't put it on the strongest settings until you've used it a few times on the lower settings first. Might be the best all-around unit available today. One reviewer said that it was a type of torture you got used to and then learned to love. Highly recommended! Amazon Price: $72.95 (as of April 4, 2019 6:55 am - Details) Product prices and availability are accurate as of the date/time indicated and are subject to change. Any price and availability information displayed on the Amazon site at the time of purchase will apply to the purchase of this product. This popular massager (probably because of the discounted price) offers a powerful kneeding massage with several programmed options and even a remote control (you can operate it without the remote, of course). A nice benefit of this foot massager is that you can get a pretty good calf rub if you lie down and put your legs in it. One of the complaints we've heard is that the instructions are poorly written. 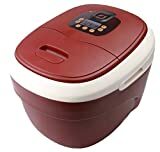 However, if you don't mind experimenting with the different settings, than you really can't beat the price on this unit for a strong foot and calf massage. Amazon Price: $299.99 $194.19 You save: $105.80 (35%) (as of April 4, 2019 6:55 am - Details) Product prices and availability are accurate as of the date/time indicated and are subject to change. Any price and availability information displayed on the Amazon site at the time of purchase will apply to the purchase of this product. PRICE MAY BE INCORRECT ON THIS LISTING -- AFTER YOU CLICK THE LINK, CLICK ON AVAILABLE FROM THESE SELLERS TO SEE THE ACTUAL DEALS!!! 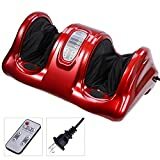 ***Note that the Red One in the big picture at the top of the page is currently unavailable and this is the same one in silver*** Free Amazon Prime Shipping is available Also****The uComfy leg and foot massager uses a combination of heat, kneading, and vibration to refresh muscles and joints. A series of 16 independent air bags deeply massage reflex points in your calves, ankles, and feet for a rejuvenating effect. The massager heats up to relax muscles, while the vibration from 4 vibration disks stimulates circulation. All functions--massage, vibration, and heat--have adjustable levels, so you can customize the massage. I suggest starting with the weaker settings until you are used to it. It includes a 15-minute auto shut-off timer, removable fabric covers (easy cleaning) and you can adjust the angle for a comfortable seating position. This is the one to get if you're looking for lower leg and foot at the same time. Great discounts on Amazon. Amazon Price: $170.86 (as of April 4, 2019 6:55 am - Details) Product prices and availability are accurate as of the date/time indicated and are subject to change. Any price and availability information displayed on the Amazon site at the time of purchase will apply to the purchase of this product. Amazon Price: $129.99 (as of April 4, 2019 6:55 am - Details) Product prices and availability are accurate as of the date/time indicated and are subject to change. Any price and availability information displayed on the Amazon site at the time of purchase will apply to the purchase of this product. 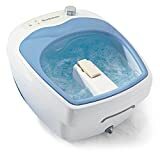 Brookstone is known for supplying high-quality products and this foot-bath foot massager is a great one. Slip your feet in and two powerful water jets get to work right away. Just choose your speed, sit back and enjoy as it works to increase circulation, relieve tight muscles and relax tired feet. But it's not just water jets, there are 2 rolling nodes that knead your arches for complete relaxation. And get this, it's like a total spa experience because there's a removable pumice stone to exfoliate the skin on your pads and heels! Water and heat is a great combination and the hot water control heats the water up to 115F and maintains the temperature so you never have to go running for hot water. It's nice and big and can hold feet up to size 14. Big discounts going on now so get it while the deals are good! Free Shipping from Brookstone.